Fantastic Beats and Where to Find Them. 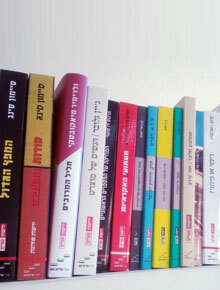 Books in the Attic (Sifrey Aliyat Hagag in Hebrew) is a family-owned, small, independent, quality publishing house. It was founded twenty years ago in Tel-Aviv by Dr. Yehuda Melzer, who taught philosophy at the Hebrew University in Jerusalem and at Tel Aviv University before launching his first publishing firm (Adam Books) and becoming a full-time publisher. At Books in the Attic Yehuda was later joined by his son, Ilai, who now runs the company, while Yehuda serves as editor-in-chief. Books in the Attic is fully independent and deliberately small but at the same time enjoys an advantageous arrangement: we publish almost all our titles with Yedioth Books, the book division of Yedioth Ahronoth, the biggest media conglomerate in Israel. They handle the marketing, sales, storage, and distribution of our books. This successful affiliation has allowed us to remain an intimate operation and to dedicate our efforts exclusively to the creative and editorial process. Children's and YA Books – William Steig, Shel Silverstein, Ernst Gombrich's best-selling A Little History of the World, the Geronimo Stilton Series, Night School and Harry Potter. Finally, and very selectively, we do publish some Hebrew authors. Our most successful original titles are the best-selling novels by award-winning author Haim Sabbato, Assaf Gavron (The Hilltop) and the non-fiction titles by historian Aviad Kleinberg and astrophysicist Hagai Netzer. One of our most recent Hebrew titles is a critical essay by Shaul Arieli and Michael Sfard about Israel's wall in the West Bank. Recently, the ranks of our salaried employees (as opposed to our many wonderful freelancing friends) have dramatically swollen – from two to three! – with the joining of Hanan Elstein, an editor who specializes in German literature. Among the authors he has acquired and edited are Kehlmann, Kevin Vennemann and Marcel Beyer.